“Like sand through an hourglass, so are the Days of Our Lives….” Thus opened a soap opera that reminds me of my childhood. My mother never watched them, calling them nonsense and pap. I took a short foray into them in High School when it was cool to watch All My Children. 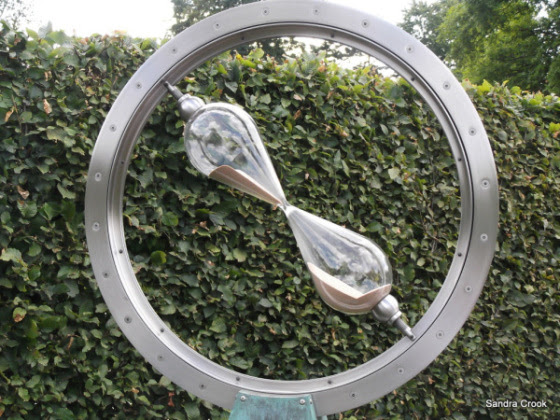 This hourglass looks like a hybrid hourglass/sundial device. I’m not sure how it works, but it’s certainly intriguing. “Mom! Where are you?” Ellen stomped around the house. Her mom knew she needed a ride to the mall. “MOM!” Exasperated, she saw the keys on the hook. She’d be 16 soon. Why couldn’t she drive herself? Her mother was always saying time was relative – whatever that meant. Why couldn’t she be like normal mothers? Ellen battled the nerves in her belly. Nothing to driving, really. Easy as falling off a log. Peeling out, her last view was her mom frantically waving her arms. Glass splintered and time shifted on impact as the final grain of sand slid through the hourglass. oh, that did not end well! the story is well told, however. No – the ending surprised me, too. I wasn’t sure where the story was going to go! Thanks for reading! Oh wow, that’s a powerful one. Well done. Thanks, Carrie – glad you enjoyed it. Yes – what a horrible thing to witness. Thanks for reading! How awful! If only she could learn the lesson without paying such a high price. The ending was pretty bleak. I kind of surprised me that’s how it all worked out. Thanks for reading! That ‘last grain of sand’ line was arresting. Well done, Dee. Thanks, Sandra. It was inspired by your prompt! Oops, Erin. Sorry, I had Dee on my mind, she’s just before you. I knew you meant me! And I saw I was right after Dee. I liked having her by my side!! What a traedy – a young life lost to impatience. Yes, it felt quite tragic to write. I’ll aim for a happy story next week! So typically hasty teenager, very real. Sometimes I wonder how I made it that far, looking back at my own idiocies. Good, sad story. Yikes! When we’re young the cocepts of pain and death aren’t really well formed…. Oh, no! How tragic. It happens in a split second. I thought your description of the crash was really effective. I remember those soap operas. Mine was General Hospital. I loved the bit with Luke and Laura. Ouch. Most people get to learn from the mistakes of their youth. Not her, I fear. Nicely written! My mother loved soap operas and had two or three favorites she watched religiously. Great use of the prompt, Erin. So sad to lose a daughter so young. Time to lock up that egg timer. Time is relative. You’ve proved that in 100 words. Tragic. And unfortunately not fiction for lots of young people who act on dangerous whims like Ellen does. Well told. So much emotion and story in so few words. Well done. Great story… love the build-up, the thought processes of the teen. Though a sad ending, this was very well-written. All of my friends watched All My Children.. I preferred Dark Shadows 😉 Ha!